In the early stage of optical fiber communication, one optical fiber can only transmit signals of one wavelength. This is known as conventional two-fiber Bi-Directional communication – at least two fibers are needed to accomplish the full-duplex communication with TX and RX optical signals. With the development of WDM technology, transmitting and receiving of optical signals on separate wavelength can be achieved through only one single fiber. 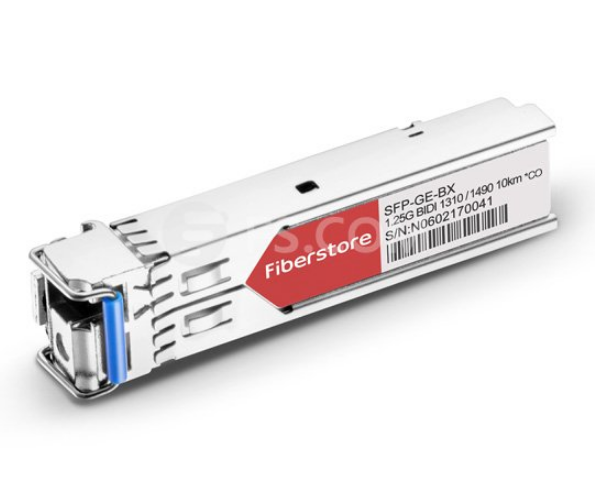 This single fiber BiDi transmission gradually becomes a popular and cost-effective solution for today’s data center and IT infrastructure, because it helps to maximize the capacity and usage of optical fibers. Consequently, BiDi optical transceiver as the basic component plays an irreplaceable role in the WDM BiDi transmission application. This article will generally introduce Cisco BiDi SFP transceivers, including GLC-BX-U, GLC-BX-D, GLC-BX-20U, GLC-BX-20D, GLC-BX40-D-I, GLC-BX40-U-I, GLC-BX80-D-I, GLC-BX80-U-I, GLC-BX120-U, GLC-BX120-D, etc. What Is a BiDi SFP? BiDi SFP transceiver can be defined as a compact, hot swappable, input/output optical module that can transmit and receive data to/from interconnected equipment through a single optical fiber. Unlike traditional optical transceivers, BiDi optical transceivers are fitted with wavelength division multiplexing (WDM) diplexers, which combine and separate data transmitted over a single fiber based on the wavelengths of the light. To simplify it, conventional optical module has two ports – the TX for the transmit port and the RX for receive port; but BiDi transceiver has only one port to complete the 1310nm optical signal transmitting and 1550nm optical signal receiving, or vice versa. Therefore, BiDi transceivers must be deployed in matched pairs with their diplexers tuned to match the expected wavelength of the transmitter and receiver. These BiDi optical transceivers can offer bi-directional data links over single-mode fiber up to 120 km. BiDi SFP transceiver is applicable to many access networks: passive optical networks (PON) and point-to-point, digital video and closed circuit television (CCTV) applications, inter-system communication between servers, switches, routers, optical add drop multiplexer (OADM), WDM fast Ethernet links, SDH/STM-1, SONET/OC3, metropolitan area networks and other optic link. 1G BiDi SFP is also known as 1000BASE-BX SFP, which use two different wavelengths (1310nm-TX/1490nm-RX, 1310nm-TX/1550nm-RX, 1490nm-TX/1550nm-RX and 1510nm-TX/1570nm-RX) for transmission in different distance. 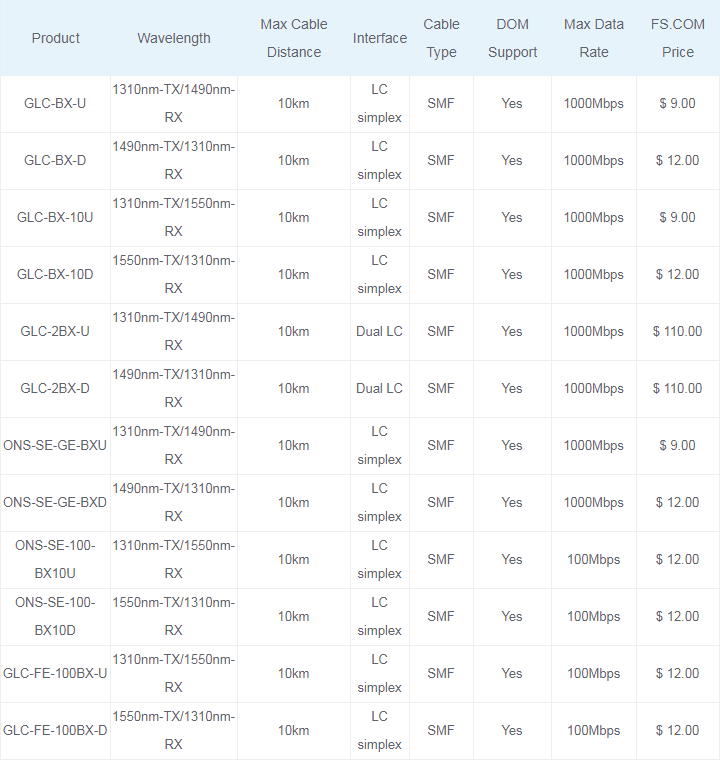 The following will list some main Cisco BiDi SFP modules in 10km, 20km, 40km, 80km and 120km. The Cisco GLC-BX-D and GLC-BX-U is a pair of 10km BiDi SFP transceiver with LC duplex connectors, operating on a single strand of standard SMF. The GLC-BX-U transceiver operates at 1310nm-TX/1490nm-RX wavelength with upstream bidirectional single fiber, while the GLC-BX-D transceiver operates at 1490nm-TX/1310nm-RX wavelength with downstream bidirectional single fiber. These two BiDi optical modules, compliant to 1000Base-BX standard, are rated for distances up to 10 km over SMF and a maximum bandwidth of 1Gbps. A 1000BASE-BX-D device is always connected to a 1000BASE-BX-U device with a single strand of standard SMF. In addition, the GLC-BX-D and GLC-BX-U BiDi SFPs also support digital optical monitoring (DOM) functions according to the industry-standard SFF-8472 multisource agreement (MSA). This feature gives the end user the ability to monitor real-time parameters of the SFP, such as optical output power, optical input power, temperature and transceiver supply voltage. GLC-BX-20U and GLC-BX-20D are Cisco 20km BiDi SFP transceivers that work with single mode fiber. The GLC-BX-20U operates at 1310nm-TX/1550nm-RX wavelength, and GLC-BX-20D operates at 1550nm-TX/1310nm-RX. So these two BiDi SFPs always work in pairs. Their max data rate is 1000Mbps. FS.COM compatible Cisco BiDi transceivers are high performance, cost effective modules supporting data-rate of 1000Mbps and 20km transmission distance with SMF. Among the Cisco 20km BiDi SFPs, Cisco Linksys MFEBX1D provides up to 155Mbps bi-directional data transfer rate at distances up to 20km on a single fiber core. These bidirectional SFP transceivers allow data transfer in either direction through a single optical fiber by employing separate wavelengths travelling in either direction. Cisco GLC-BX40-D-I and GLC-BX40-U-I is a pair of 40km BiDi SFP modules for Gigabit Ethernet 1000BASE-BX and Fiber Channel communications. 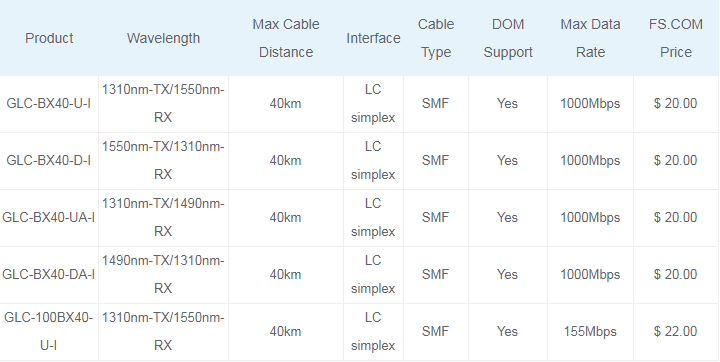 They support link length of up to 40km point to point on single mode fiber at 1Gbps bidirectional and use an LC connector. The GLC-BX40-D-I is 1550nm-TX/1310nm-RX 40km BiDi WDM SFP simplex transceiver module, GLC-BX40-U-I is 1310nm-TX/1550nm-RX BiDi WDM SFP module. 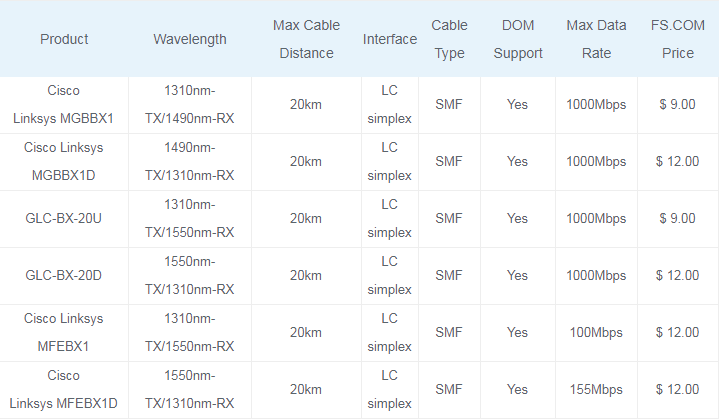 They are specified for duplex optical data communications such as 1000BASE-BX Gigabit Ethernet per IEEE802.3z and 1G Fiber Channel extended reach application. The Cisco GLC-BX80-D-I and GLC-BX80-U-I SFPs are 1G BiDi SFP modules that provide 80km transmission distance over single strand of single-mode fiber. GLC-BX80-D-I operates at 1570nm-TX/1490nm-RX wavelength, whereas GLC-BX80-U-I operates at 1490nm-TX/1570nm-RX. These bidirectional SFP transceivers are intended mainly for connecting high-speed hubs, Ethernet switches, and routers together in different wiring closets or buildings using long cabling runs, and developed to support longer-length on fiber backbones. Compared with commonly used dual fiber SFP transceiver modules, the BiDi SFP transceiver allows end users to reduce the total cost on fiber cabling infrastructure by requiring half of fiber cables, providing increased transmission capacity very convenient without installing new fibers. The Cisco GLC-BX120-U and GLC-BX120-D are 1490nm and 1550nm bidirectional SFP transceivers that are used with single mode optical fiber. They also use two wavelength 1490nm-TX/1550nm-RX(1550nm-TX/1490nm-RX) simultaneously. These BiDi SFP modules can support transmission distance up to 120 km, which are connected through pluggable LC connector type optical interface. They have a DFB (Distributed Feedback) type transmitter, an APD (Avalanche Photo-Diode) type receiver, an LD (Laser Driver), a limiting amplifier and digital diagnostic monitor. Those BiDi SFP transceivers are Class 1 laser safety product which complies with US FDA regulations, SFP MSA, SFF-8472 and RoHS standards. More importantly, 120km SFP modules have the same or even lower transmit power as compared to 80km SFP. It is the reason that 120km modules extend the range thanks to receiver not transmitter. 120km modules have much better receiving sensitivity than 80km modules. BiDi SFP transceiver serves as an ideal and feasible solution in situations where only limited fibers or limited conduit space is available. And the deployment of BiDi optical transceivers efficiently enhances the bandwidth capacity of the existing optical fiber infrastructure and help to achieve economical and reliable performance of the optical network. Although BiDi transceivers may be more expensive than common transceiver modules, they can save you the cost on fiber cables from the long run. This entry was posted in SFP Modules and tagged 10km BiDi SFP, 120km bidi sfp, 40km bidi sfp, 80km BiDi SFP, bidi cwdm module, bidi optical module, bidi optical transceiver, BiDi SFP transceiver, Cisco BiDi SFP, Multimode bidi sfp by Stephanie.Li. Bookmark the permalink.